INFINITY QUALITY! BEAUTIFUL SUV WITH THIRD ROW SEATING! POWER EVERYTHING! GREAT SERVICE RECORDS! CLEAN INSIDE AND OUT! Includes:V8, 5.6 Liter, Automatic, 5-Spd w/Overdrive, 2WD, Power Liftgate Release, ABS (4-Wheel), Anti-Theft System, Keyless Entry, Air Conditioning, Power Windows, Power Door Locks, Cruise Control, Power Steering, Tilt Wheel, AM/FM Stereo, XM Satellite, Bluetooth Wireless, Dual Air Bags, Side Air Bags, F&R Head Curtain Air Bags, Fog Lights, Roof Rack. 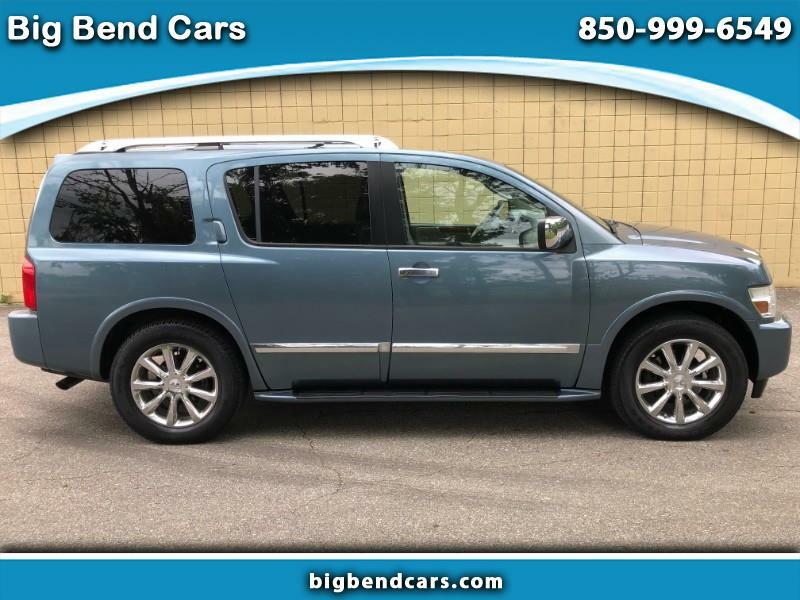 Competing with Cadillac Escalade and Lincoln Navigator, The 2008 Infiniti QX56 is Infiniti's full-size luxury SUV and features freshened interior and exterior styling. Under the hood is a 5.6-liter, 320 hp V-8 and 5-speed automatic transmission driving a 2-wheel or optional 4-wheel drive system. 7 or 8 passengers are treated to scads of luxury appointments including a heated steering wheel, 8 inch rear entertainment screen, hard drive navigation, Bluetooth, and new wood trim. The Q56 has a towing capacity is up to 9,000 lbs properly equipped. Safety features include 4-wheel disc brakes, stability control, tow/haul mode, front, side and curtain airbags, as well as an intelligent cruise control. The QX56 is three tons of pure luxury with all the capabilities of a full size SUV. Leather-trimmed upholstery and a navigation system with voice recognition and real-time traffic are standard. Also standard are dual-zone automatic climate control with manual rear controls; heated, power-tilting, leather-wrapped steering wheel with audio controls; cruise control; heated first- and second-row bucket seats; 10-way power-adjustable driver's seat; 8-way power-adjustable passenger seat; power-adjustable pedals; memory for the driver's seat, mirrors, and pedals; 60/40 split power-folding 3rd-row bench seat; heated power auto-dimming exterior mirrors; power windows and locks; remote keyless entry; keyless access and starting; sunroof; Bose AM/FM/CD stereo with 12 speakers and rear controls; Music Box hard-drive audio; auxiliary audio input jack; satellite radio; rearview camera; Bluetooth wireless cell phone link; universal garage door opener; auto-dimming rearview mirror; power liftgate; automatic xenon headlights; theft-deterrent system; fog lights; roof rack; running boards; load-leveling suspension; and P275/60R20 tires on chrome alloy wheels. Safety features include the latest generation front airbags that deploy at different rates depending on crash severity and occupant seatbelt use. Side-impact airbags are provided for torso protection for the front-seat passengers. Full-cabin curtain airbags come standard for improved head protection for passengers in all three rows and they deploy in case of a rollover. A rearview video system comes standard: When the transmission is in reverse, this system displays on the navigation screen the view from a camera mounted above the rear license plate; it can help the driver see if an object or child is behind the vehicle. All QX56 models have active head restraints for the front row. Also standard are a tire-pressure monitor, antilock brakes with brake assist and electronic brakeforce distribution, traction control, and electronic stability control. Nissan's 5.6-liter, 32-valve, double overhead-cam V8 offers impressive output, rated in the QX56 at 320 horsepower at 5200 rpm and 393 pound-feet of torque at 3400 rpm. When it was first released in 2004, the QX56 was at the top of the power chart in the large SUV class. Since then, Cadillac and Toyota have topped it, though it is still ahead of the Navigator. Towing demands high torque at low rpm and that's where the Infiniti's power is concentrated. Infiniti QX56 pairs a luxurious, roomy premium SUV interior with serious truck-like towing (up to 9,000 pounds) and hauling ability. The QX56 also has a very roomy interior, with space for up to eight and class-leading second-row legroom.